Acknowledgements: We want to thank the local naturalists who contributed information and writing to the trail and wildlife sections: Marsha Elrod, Kathy McAleese, Andy Butler, Margie Crisp, Claude Morris, Carol Reidy, Bill Brooks, and Steve Box. The Utley to Tahitian Village segment of the Colorado River consists of three paddling trails collectively known as the Bastrop Paddling Trails. This segment is a 24 mile free-flowing section composed of two distinct geological segments divided into three trails: Wilbarger Trail, El Camino Real Trail, and Red Bluffs Trail. The Wilbarger Trail flows through a unique geological formation that bisects the Calvert Bluff formation just upstream of Bastrop. A number of faults and escarpments in the Recklaw and Carrizo Formations have profoundly influenced the channel, which is generally narrower, and normal meander patterns are interrupted by resistant sandstone formations. Although the river bed is similar to the upstream segment, the channel is strewn with large, sandstone boulders of local origin. Two tributaries enter the Colorado River along the Wilbarger Trail, Wilbarger and Big Sandy Creeks. Continuing downstream, through the El Camino Real and Red Bluffs trails, the river is wide and slow-moving with a few rapids. The flood plain is flat, and limestone outcroppings are not as abundant as they are above the Highland Lakes. Several earthen cut-banks are exposed throughout this section. The river bottom is composed of sand and gravel, with sand and gravel bars and islands appearing frequently and providing suitable areas for camping. There is usually a sufficient flow of water in the river for recreational and aquatic life uses. There are no difficult rapids or hazardous places on the entire section, although a few minor rapids are found. The banks of the Colorado gradually steepen as the river moves downstream through the Red Bluffs Trail where the flood plain deepens. The steep banks become extremely scenic with high sandstone bluffs and cliffs, along with several islands and sand bars that are often utilized for camping and day recreation. Wilbarger Trail – A 14 mile long trail from the Highway 969 bridge at Utley to Fisherman’s Park. Depending on water conditions this segment can take 2-6 hours to float. It has a number of islands and several side-stream “canopy of trees” that provide for good birding and fun paddling for the more skilled. Wilbarger creek can be paddled from the confluence with the Colorado River up-stream for several miles. El Camino Real Trail – The 6-mile long trail from Fisherman’s Park downstream to the Lost Pines Recreational Trails take-out point can be completed in 1-1/2 to 4 hours, depending on water levels and flow rates. An island halfway provides a convenient place to swim, picnic, skip rocks, or camp-out. The Wilbarger Trail segment provides unique habitat for the blue sucker (Cycleptus elongatus), a species that is depleted throughout its natural range and is listed as threatened in the state of Texas. The blue sucker is one of the most common fishes in the segment between Webberville and Smithville and is protected throughout the lower Colorado River. The blue sucker is a large long-lived sucker native to large rivers of the Mississippi Basin and occurring sporadically in some Western Gulf Slope drainages of Texas as far south as the Rio Grande. The blue sucker was once abundant, however, they are now considered rare throughout most of their range. Blue suckers occupy deep high-velocity habitats over firm substrates (typical of Wilbarger Trail). They feed on aquatic insects and can grow to over 800 mm total length and live anywhere from 9-22 years. Reproduction occurs in early to late spring when blue suckers migrate to spawning riffles where their adhesive eggs are deposited on the substrate. Eggs hatch in about 6 days. Although larval blue suckers have occasionally been collected in backwater and off-channel habitats, information on the ecology of young blue suckers is limited because juveniles are rarely collected. In the Colorado River, adult blue suckers are fairly common in deep fast rapids over gravel, cobble, boulder, and bedrock substrates. 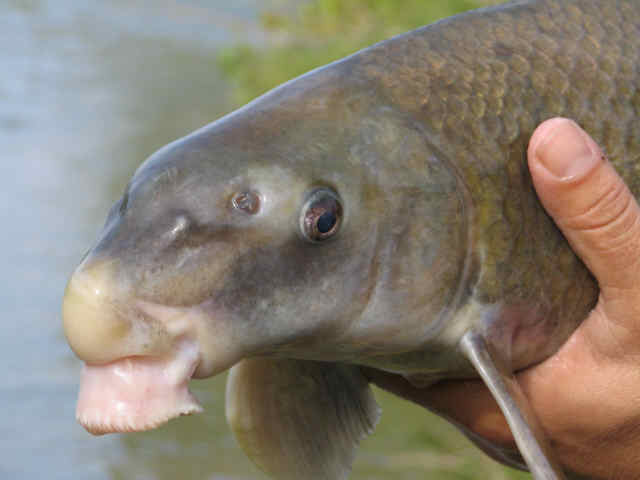 Despite considerable effort, there have been no confirmed collections of juvenile blue suckers from the lower Colorado River. The most abundant non-game fish in this section of the river is the red shiner (Cyrinella lutrensis), followed by the blacktail shiner (Cyprinella venusta) and the bullhead minnow (Pimephales vigilax). Dusky darter (Percina sciera), Texas logperch (Percina carbonaria), suckermouth minnow (Phenacobius mirabilis), orangethroat darter (Etheostoma spectabile), central stoneroller (Campostoma anomalum), chub (Macrhybopsis spp.) and juvenile channel catfish are common in riffles. Flathead (Pylodictis olivaris) and channel catfish (Ictalurus punctatus), gray redhorse sucker (Moxostoma congestum), Guadalupe bass (Micropterus treculii), river carpsucker (Carpiodes carpio) and gizzard shad (Dorosoma cepedianum) are found in the deep runs. Shallow runs are typical habitat for the red shiner, blacktail shiner, bullhead minnow, mimic shiner, and juvenile Guadalupe bass. Smallmouth buffalo (Ictiobus bubalus) and common carp (Cyprinus carpio) are found in the deep pools, while largemouth bass (Micropterus salmoides), longear sunfish (Lepomis megalotis), bluegill (Lepomis macrochirus), green sunfish (Lepomis cyanellus), Rio Grande cichlid (Cichlasoma cyanoguttatum), mosquitofish (Gambusia affinis), sailfin molly (Poecilia latipinna) and blackstripe topminnow (Fundulus notatus) are found in shallow pools and backwaters (2). Longnose (Lepisosteus osseus), spotted (Lepisosteus oculatus), and alligator gar (Lepisosteus spatula) are frequently seen in the river feeding along the surface. Freshwater drum (Aplodinotus grunniens) is common. The impressive Barred Owl may surprise the lucky observer on a cloudy day or at dusk. Belted Kingfishers perch on overhanging branches and dive for fish, sometimes even next to fortunate paddlers. Their rattled call can be heard as they fly along the river bank. Great Blue Heron, Wood Duck and Killdeer also reside along the water’s edge. Woodpeckers such as the Red-bellied Woodpecker, Downy Woodpecker, and magnificent Pileated Woodpecker inhabit the riparian woodlands along the river. The Pileated is an area resident and has an unmistakable loud calls and brilliant red crests. Other familiar species, including American Crow, Blue Jay, Northern Mockingbird, Northern Cardinal, Carolina Chickadee, Carolina Wren and Tufted Titmouse are all abundant in the surrounding woodlands. The riparian habitat also provides spring and summer nesting spots for a number of unique residents including Scissor-tailed Flycatchers, Eastern and Western Kingbirds, and Dickcissels. Cliff, Bank, Rough-winged and Barn Swallows as well as Purple Martins nest in the area. Summer paddlers are treated to aerial displays as the swallows drink water on the wing and hunt insects along the river. Summer brings an assortment of egrets and herons including Great Egret, Snowy Egret, Little Blue Heron, Green Heron and Cattle Egret. Nesting songbirds that may be seen and are easily heard along the river include Indigo Bunting, Painted Bunting, White-eyed Vireo, and more rarely, Red-eyed Vireo. Prothonotary Warbler, Common Yellowthroat, Northern Parula, Eastern Bluebird, Great-crested Flycatcher, and Summer Tanager also nest along parts of the river. Temperate days during the winter are great times to see the winter residents of the Colorado River. Double-crested Cormorants, Anhingas, American Coots, and Pied-billed Grebe can be seen as well as Belted Kingfishers, Green Kingfishers and Ringed Kingfishers. Winter brings ducks such as Mallards, Gadwalls, American Wigeon, Blue-winged Teal, and Green-winged Teal to the river along with a host of sparrows, American Goldfinch, Cedar Waxwing, American Robin, Yellow-rumped Warbler, and Orange-crowned Warbler. Palm Warblers have also been sighted along the banks in winter. Because Bastrop County is in the Central Flyway, spring and fall bird migrations bring an extraordinary variety to the region. Shorebirds, including Willets, sandpipers, plovers and Killdeer. Multiple species of warblers glean through the trees for insects before continuing their journeys. Migrating warblers are possible in spring and fall, including Mourning Warbler, American Redstart, Yellow-breasted Chat, and Yellow Warbler. Sandpipers such as Greater Yellowlegs, Spotted Sandpiper and Wilson’s Snipe crowd together to feed along gravel bars. Mississippi Kites, Swainson’s Hawks, Cooper’s Hawks and Kestrals are just a few of the raptors commonly spotted. Eastern Phoebe, Northern Flicker, Ruby-crowned Kinglet, Golden-crowned Kinglet, and Blue-gray Gnatcatchers are also present seasonally. Much if the wildlife that lives along the river is nocturnal, such as raccoons, opossums, and armadillos. White tail deer, coyotes, and even an occasional fox or bobcat may be visible along the shoreline during daylight hours, and wild turkey are plentiful throughout most of the area. In the river watch for logs or other sunning spots for turtles, including river cooters, red-eared sliders, map turtles, soft-shell turtles, and common snapping turtles. Water moccassins, diamond-backed water snakes, and blotched water snakes inhabit the river, while ashore copperheads, coral snakes, Texas rat snakes, eastern hognose, and eastern diamondback rattlesnakes may be encountered, so step carefully! (italics indicate venomous snakes). The riparian habitat is typical of bottomland hardwood forest with trees that grow in floodplain areas. Native Texas pecan is abundant, along with majestic eastern cottonwood, American sycamore, and black willow. Bald cypress are found single or in isolated groups along all segments – though not so abundantly as was typical of the native flora – having been used to build the state capitol. Hickory, ash, American elm, and cedar elm are common, with a dense undercover of greenbriar and poison ivy, while grapevines and flowering trumpet vines climb high in the tree tops. Roughleaf dogwood, flame-leaf sumac, and red mulberry inhabit the under-story, along with yaupon holly and American beautyberry, while graceful inland seaoats and other shade grasses are abundant. Delicate maidenhair fern can be seen clinging to the river bank. Paloverde and vitex are common along Wilbarger Trail. The El Camino Real Trail segment goes through the Lost Pines, a section of Loblolly Pines that has become isolated from the East Texas piney woods. However, few pine trees are visible from the river since they are not typical of riparian habitats (there is one on the El Camino Real Trail and several visible along the Red Bluffs Trail segments). Sport fishing is very good in this section of the river. Popular game fish are Guadalupe bass, blue, channel, and flathead (opelousas) catfish, and freshwater drum (gaspergou). Largemouth bass and sunfish are common in the backwater pools. Light-line and small lures such as jigs, plastic worms, and spinner baits are recommended for spin casting. Heavier tackle is needed for bottom fishing and larger game fish attracted to live bait. Kayak fishing is gaining in popularity. Local fishing guides are available through outfitters. Bastrop Paddling Trails are located on the lower Colorado River. The upper- and mid-reaches the river are impounded by six reservoirs, whereas the lower 300 miles of the river is un-impounded and free-flowing below Longhorn Dam. It flows through the cities of Bastrop, La Grange, Columbus, Wharton, and Bay City before entering Matagorda Bay. Though “free-flowing” below Longhorn Dam, flow through this portion of the river is affected by the Highland Lakes, and specifically regulated by Buchanan and Mansfield Dams. As such, the river is readily influenced by rainfall runoff that may create temporary high flows and undesirable water quality conditions. Flow and water quality information is available to paddlers at the previous link, and at www.lcra.org. Like many rivers in this country, water quality in the Colorado has greatly improved over the last few decades but has not been returned to pre-urbanization standards. Management of the flow regime of the river to provide for hydroelectric power, irrigation, cattle, and flood control has resulted in a river that is respected for the quantity of water managed, but not yet for the quality of experience it provides to surrounding communities and wildlife. Though this portion is relatively un-developed and free from urbanization, it also reflects the urbanization that has taken place upstream (Austin metro-area) and the impact of cattle grazing along the shores and down to the water’s edge. The Bastrop Paddling Trails are located in a segment of the Colorado River that the Texas Commission on Environmental Quality (TCEQ) has designated as a public water supply, suitable for contact recreation, and having exceptional aquatic life. The segment has habitat characteristics that are outstanding for their natural variability, an exceptional or unusual species assemblage, an abundance of sensitive species, exceptionally high species diversity and richness, and a balanced trophic structure. The “exceptional aquatic life” designation requires that the segment meet the highest standards for temperature, pH, dissolved oxygen, chlorides, sulfate, total dissolved solids, and bacteria. The Colorado River throughout the study area has been identified by the TPWD as an ecologically significant stream segment due to the presence of the state threatened blue sucker and the stream segment’s overall use. Streams contribute to the flowing waters in Texas, influence downstream water quality, and assimilate domestic wastewater. Healthy rivers and streams maintained by instream flows supply drinking water, support agriculture and industry, support diverse fish and wildlife, and enhance fishing, hunting, and other recreational activities that positively affect Texas’ economy. Water conservation is one way to ensure that the natural heritage of Texas is protected for all…every drop counts! To conserve rivers and streams, keep them clean, maintain native vegetation, and participate in river clean-ups! (1) Mosier, D. T., and R. T. Ray. 1992. Instream flows for the lower Colorado River: reconciling beneficial uses with the ecological requirements of the native aquatic community. Lower Colorado River Authority. (2) BIO-WEST, Inc. 2007. Draft Instream Flow Guidelines Development: Colorado River flow Relationships to Aquatic habitat and State Threatened Species: Blue Sucker. LCRA-SAWS. (3) Bradsby, David, Albert El-Hage, Dan Moulton, and Peter Sorensen. 2000. Evaluation of Natural Resources in Bastrop, Burleson, Lee, and Milam Counties. Texas Parks & Wildlife Department, Resource Protection Division: Water resources Team. (4) Bradsby, David, Albert El-Hage, Dan Moulton, and Peter Sorensen. 2000. Evaluation of Natural Resources in Bastrop, Burleson, Lee, and Milam Counties. Texas Parks & Wildlife Department, Resource Protection Division: Water resources Team.